OUCH!! I've done that too. No fun at all. I'm running late too. I'm still working on writing mine up and should have it ready by the end of the day...i hope. please do submit your entry. as i have said, better late than never. 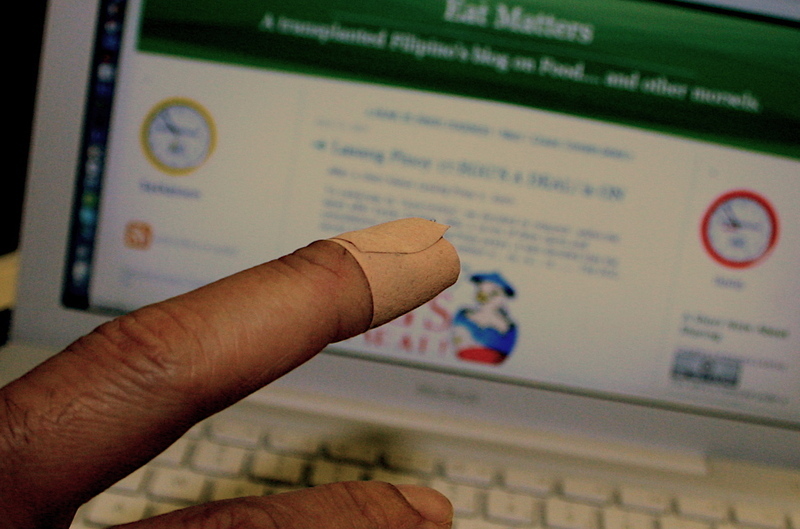 oh, i pity your finger A...pero pwede rin ba humabol? hehehe...yeah, blame it on the Henckels and serrated pa! i heard it's the sharpest brand around! It is good fishing in troubled waters. It's no use pumping a dry well. When designed in early, most applications can benefit from parallel processing. It's true that synchronization can be a challenge at first, but it all just makes sense once you've worked with it longer. Blood spurted out that I had to put pressure on it and run it through cold running water until the bleeding stopped.